6563 Corporal Henry James Bird. Son of Matthew and Louisa Bird of South Molton. Born in North Molton in 1873. Came home safely bu arrived one week before the main group in June 1901. 6570 Corporal (later Sergeant) James Allen Marhsall. Taken prisoner and released 13 December 1900 at Nooitgedacht. Also awarded the Queen's South Africa (QSA) Medal Clasps: Diamond Hill, Cape Colony, Orange Free State, South Africa 1901. Selected to receive his medal personally from the King 31 August 1901. Attached to 27 Company 7th Battalion of the Imperial Yeomanry. Gazetted 27 September 1901. 1145Trooper Ernest J. Bawden of "C" Squadron, Royal North Devon Hussars. Son of Albert and Mary Bawden of Bishops Nympton. Born in Bishops Nympton in 1885. Returned home safely. 6566 Trooper William Giles Woolway Cole. Also awarded the Queen's South Africa (QSA) Medal Clasps: Diamond Hill, Cape Colony, Orange Free State, South Africa 1901.Attached to 27 Company 7th Battalion of the Imperial Yeomanry. 6167 Trooper Harris Edwin Heywood. Son of John and Mary Heywood. Born in Dulverton in the December Quarter of 1874. Mentioned in Despatches 8 March 1901. He returned safely to farm in Dulverton where he married Hannah Pring. Trooper Frederick William Howard. Son of Thomas and Emily Howard of 11 South Street, South Molton. Born in South Molton in 1878. Returned home safely. 6571 Trooper John Merson. Son of John and Harriet Merson. 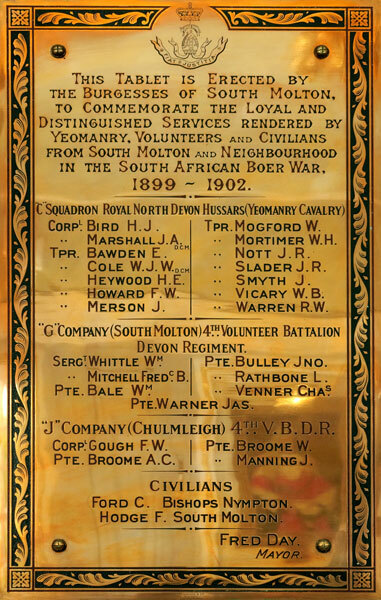 Taken prisoner and released 13 December 1900 at Nooitgedacht. attached to 27 Company (Devon) 7 Battalion Imperial Yeomanry. Awarded the Queen's South Africa (QSA) Medal Clasps: Diamond Hill, Cape Colony, Orange Free State, South Africa 1901. 6573 (rank recorded as Trooper on plaque) but listed elsewhere as Sergeant/Farrier. Son of William and Mary Ann Mogford. Mentioned in John Bawden's letters home. Returned safely and selected to receive his medals in person from the King 31 August 1901. 6572 Trooper William Henry Mortimer. Son of John and Mary Mortimer. Born in South Molton in the December Quarter of 1871. 6574 Trooper John Richards Nott. Son of Louis and Ann Nott. Born in West Buckland in the September Quarter of 1873. 6577 Trooper John Richard Slader. Son of Richard and Mary Slader. Born in North Molton in 1876. Returned home to farm at North Molton. 6578 Trooper James Smyth. Son of John Smyth (widower) of East Street, North Molton. Attached to 27 Company 7th Battalion of the Imperial Yeomanry. 1902 Trooper William Burgess Vicary or Vickery then 21169 of 76 Company (Rough Riders) 22 Battalion Imperial Yeomanry. Awarded the Queen's South Africa (QSA) Medal. Clasps: Cape Colony, Orange Free State, Transvaal, South Africa 1901, South Africa. Son of Samuel and Mary Vickery. Born in South Molton in the June Quarter of 1879. 32847 Trooper Richard Walter Warren also 32847 Farrier Sergeant Warren of 80 Company (Sharpshooters) 21 Battalion Imperial Yeomanry. Son of Susan Warren (widow) and the lte John Warren. Born in South Molton in 1869. Awarded the Queen's South Africa (QSA) Medal . Clasps: Cape Colony, Orange Free State, Transvaal, South Africa 1901, South Africa 1902. Sergeant William Whittle of "G" Company the 4th (Volunteer) Battalion, the Devonshire Regiment. Son of William and Elizabeth Whittle. Born in Honiton in the march Quarter of 1871. Returned safely to England in June 1901 to 27 East Street. Received his medal in person 9 September 1901. Sergeant Frederick Bird Mitchell of "G" Company the 4th (Volunteer) Battalion, the Devonshire Regiment. Son of Richard and Elizabeth Mitchell. Born in Chulmleigh in 1869. 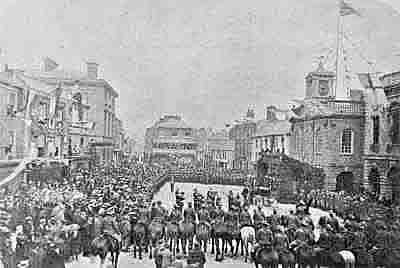 Returned safely to England in June 1901 to Fore Street, Chulmleigh. Received his medal in person 9 September 1901. Private William Bale of "G" Company the 4th (Volunteer) Battalion, the Devonshire Regiment. Son of William and Eliza Bale; husband of Elizabeth Bale. Born in Northam in the March Quarter of 1871. Returned safely to England in June 1901 to 7 Mole Cottages, South Molton. 5574 Private John Chapple Bulley of "G" Company the 4th (Volunteer) Battalion, the Devonshire Regiment. Son of John and Eliza Bulley. Born in South Molton in the June Quarter of 1871. Wounded and invalided home before the end of the war. Believed to be Leslie C. Rathbone of "G" Company the 4th (Volunteer) Battalion, the Devonshire Regiment. Born in Paignton in the March Quarter of 1882. Son of William and Elizabeth Rathbone who were schoolmaster and mistress of South Molton school. Returned home safely to North Street, South Molton. 5590 Private Charles Edmund Venner of "G" Company the 4th (Volunteer) Battalion, the Devonshire Regiment. Son ofJacob and Sophia Venner. Born in South Molton in the September Quarter of 1872. Invalided home and not able to be present to receive his medal 9 September 1901. 5591 Private James Warner of "G" Company the 4th (Volunteer) Battalion, the Devonshire Regiment. Son of Jane Warner (widow). Born in South Molton in the June Quarter of 1871. Invalided home but present in person for the presentation of medals on 9 September 1901. 2140 Private Frederick William Gough of the Devonshire Regiment. Joined the Devonshire Regiment regulars 6 March 1890 aged 18. Son of Francis and the late Mary Gough. Born in Chulmleigh in 1872. Returned home safely and was discharged from the Devonshire Regiment in 1901. It has not been possible to trace this man. Private John William Manning of "J" Company, the 4th (Volunteer) Battalion, the Devonshire Regiment. Son of James and Jane Manning. Born in Chulmleigh in 1874. Nothing is yet known of his war record but he returned home safely. It has not been possible to trace this man. A number of civilians went to South Africa with the soldiers chiefly because the army had not, at this time, trained men with certain skills. Post office technicians were particularly valued because they could set up communications as were engineers who could supervise the building of bridges etc. Vets helped with the horses and ex- police were used to contain civilian areas captured by the British. It has not been possible to trace this man. See above. A surprising number of the civilians who accompanied the troops into war did not return, seeing opportunities for themselves in a developing British Colony as peace was restored in South Africa. This photo shows the arrival of General Buller and his wife for the unveiling ceremony of the plaque shown above. The scene was photographed in 1903 by Mrs Elizabeth Askew, South Molton's very own professional photographer who had a shop in East Street. Several albums of her work can be seen in the Museum which has developed in the former Town Hall where the ceremony took place. Elizabeth, a widow with two daughters, always referred to herself as a "photographic artist".